The treatment for smoother clear skin! The results are a natural looking, fresher complexion. Lines, wrinkles, acne scars, ingrown hairs and pigmentation irregularities can be improved. The treatment is suitable for men & women of all ages here in our Manchester clinic. In principal microdermabrasion is similar to sand blasting. Fine crystals are directed onto the skin in a precise manner to dislodge dead skin debris. The diamond tip version is crystal free and uses diamond grit encrusted heads which are swept over the skin. This resultant debris is simultaneously vacuumed from the skin. Microdermabrasion stimulates circulation and triggers collagen growth for long term benefits. Our unique treatment protocol ensures a comfortable treatment with little or no irritation – you can resume your normal activities after treatment. Your treatment will include thorough cleansing, extractions of blocked pores and application of appropriate serums, hydrators and SPF – we can apply tinted treatment foundation or mineral make up too! The use of specific skincare products that we recommend will enhance results. You’re investing in your skin’s long term health – Your skincare routine will pay you dividends! Will Microdermabrasion be beneficial for me? Are there any special after-care instructions to follow to produce optimal effects? Microdermabrasion is a treatment which deeply exfoliates skin, helping to diminish sun damage, fine lines, wrinkles, reduce enlarged or blocked pores, lighten darkened areas of pigmentation – including under eye area and smooth coarse skin.It can greatly reduce the appearance of blemishes, whiteheads & blackheads. Stretch marks also respond well to this treatment. We use a doctor level microdermabrasion machine to spray fine, sand-like aluminium oxide crystals across the skin’s surface. The uppermost layer of dead skin cells is thus “sand blasted” away. This exposes the fresh skin beneath and stimulates the production of collagen. A microdermabrasion treatment takes 20-30 minutes and involves little or no recovery time. We are able to alter the intensity of the treatment at any time – we don’t use a pre-programmed machine. 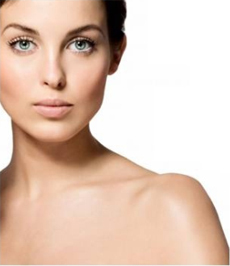 Microdermabrasion can be performed on the face, neck, chest, back and hands etc. Spotty backsWe can treat all skin types and skin colours. Fragile skin which is prone to broken veins may not tolerate the treatment well – we can advise you. After a detailed consultation your skin will be cleansed to prep for treatment. The small hand piece will be passed methodically over the surface of the skin. You’ll be aware of the suction / vacuum sensation of our machine. We will apply soothing skincare products such as antioxidants, growth factors, peptides, deep hydrators and of course broad spectrum UV protection. Luxury treatments include treatment masques, serums & foot massage with heated bootees. Skin may look flushed immediately after treatment but should return to normal in 10 – 30 minutes. Occasionally the skin may feel warm to the touch and be slightly “tingly” for up to 24 hours following treatment. We are able to adjust the intensity of the machine to suit your comfort level. Our microdermabrasion machine is a doctor quality. We can adjust treatments from very superficial “buffing” to more aggressive / intensive treatments for scars, cellulite & stretch marks. typically last 30 minutes, Our Luxury treatments last an hour. Back or chest areas may take up to an hour. To obtain optimum results, this treatment may also be used in conjunction with other treatments such as our bespoke treatment facials, injectable skin hydrators, dermal fillers or muscle relaxant injections. Most patients feel and see a difference after one or two treatments which may be sufficient for special occasions. Microdermabrasion is always performed by our clinical director Diane Nivern. Our experienced clinical nurse specialist treats deep acne scars, surgical / traumatic scars and stretch marks. Immediately! There is no healing time, no need to take time off work. You can return to your normal lifestyle immediately. We’ll recommend and supply you with specific advice and products to use post treatments. Broadly speaking you’ll need to keep the skin hydrated in the days after treatment and avoid UV exposure. The use of a broad spectrum facial sunblock is strongly recommended to avoid development of hyper pigmentation. Your skin may feel tingly or feel “tight” or dry in the days after treatment. It’s important to keep the skin hydrated and use the skincare products that we’ll recommend for you to maximise the benefits of treatment and alleviate any discomfort. You are investing in your skin’s long term health – your skincare routine will pay you dividends! Deeper treatments aimed at scar tissue or stretch marks may take around 3-4 days for the skin to recover. There is a very small risk of mild pigment changes to the skin that generally clear up within a month. The risk of any scarring is very rare. After the first treatment the skin will have a fresh, radiant glow. Improvement will continue throughout the treatment programme and generally fine lines, wrinkles and age spots become greatly diminished and many patients report that their skin feels softer, smoother and younger looking. We recommend that you have maintenance treatments through the year to keep your skin tip top. Treatment includes a full facial treatement. Please note that our microdermabrasion treatments are clinical standard, corrective treatments – You will see an improvement in your skin from the first treatment and the improvement continues with each treatment. My unique treatment protocols mean you will not leave my clinic with an irritated, bright red face!